darlings do you love to travel? part 2! Traveling can be rewarding, exhausting, frustrating, relaxing and exciting all at the same time. Our family tends to do well on vacations, especially recently. Our boy has grown and matured a little which has made a big difference in the frustrating and exhausting part to travel. Now don't get me wrong, there were some moments of craziness like when our little one thought he would jump off the trolley when know one else was getting off.....eeeekkkkk! Our Little boy in the Big city had its ups and downs, but the ups out weighed the downs any day of traveling. We stayed in a little town called Tiburon on the water over looking San Francisco. The Lodge at Tiburon was a block from the water and had an outdoor heated pool for the kids and a yummy restaurant on site. We stayed there for 3 nights and took the ferry into San Francisco two of those days. 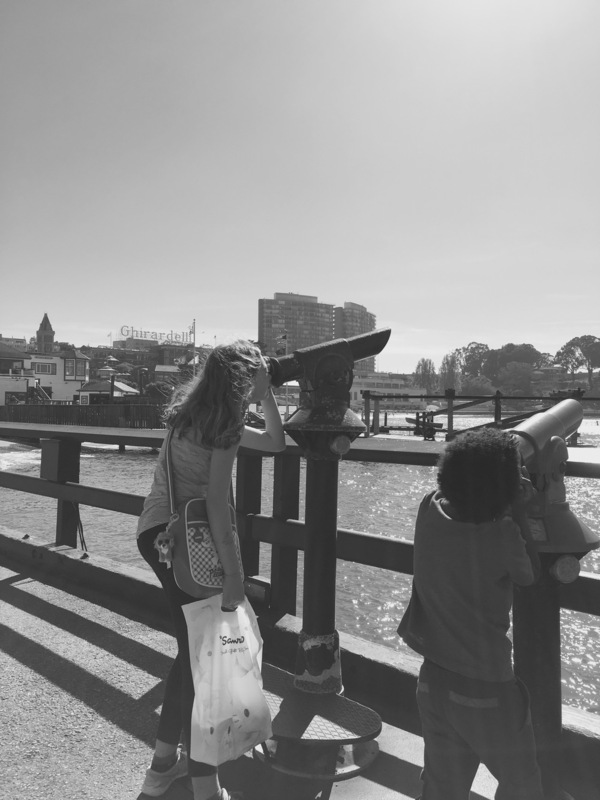 The kiddos loved the ferry and the adventure of the city that awaited them. The views in San Francisco are incredible and there are so many opportunities for fun photography. I especially enjoyed Chestnut street. It is a must see with beautifully colored buildings, yummy eateries and quaint shops. I found this bright yellow alley filled with happiness. Of course behind this photo you don't hear my kids whining, me saying right here? Stand here? And an instagram hubby being incredibly patient. Exploring the city by foot and by trolley is the best way. My kids loved the pier and waterfront and there was a lot of adventures wrapped up in just two days. Now on to next adventures like doing laundry, helping with homework and styling a few homes. Until then, here is my favorite photo of our trip. darlings do you love to travel? Traveling is like an adventure out of a story book. For our family, it is a way to re-connect, spend time giggling, getting lost, problem solving and loving on each other 24/7. Travel has always been a passion of mine and when I met my husband and we had the same love affair with travel I was smitten. We lived all over California our first four years of marriage and had both lived there before getting hitched. Our first year of marriage was in Mill Valley, just outside San Francisco over the Golden Gate Bridge. Our second year was in the lovely San Luis Obispo and so many beautiful memories remain there for us. We have visited a few times over the past 11 years after moving to Oregon, but this trip was extra special and here is why. Last year was a big change moving from a much larger home to our bungalow. We did that for many reasons, one of them having more freedom to travel over the next couple of years. Our family has had a season of challenges and now to be able to venture out more has been incredible. Our son is now at an age where traveling is easier and our daughter is the perfect age to get some wonderful education through travel. We have some travel goals! Of course, not all will be met, but why not dream big? We plan to travel as a family, as a couple and as individuals for the hubs and I. What!? Travel alone and not be a wife and mama!!?? Hold on...that sounds kind of nice. We started our road trip journey to Monterey and stayed at the Hyatt Regency Monterey Hotel and Spa. I would highly recommend it as it had an outdoor heated pool, fun outdoor games and yummy food options. It was a perfect retreat with kiddos and I was able to get a deal that was comparable to much cheaper hotels in the area. The kids especially loved the ping pong area. The Monterey Pier has amazing views of the ocean filled with eateries and shops. We spent the day at the aquarium and strolled around the pier for lunch and photo taking and great discussions with our kids. Santa Cruz was a fun day stop and the Santa Cruz boardwalk was a highlight for the kids. It was the first time my daughter had ridden a roller coaster in her little life. 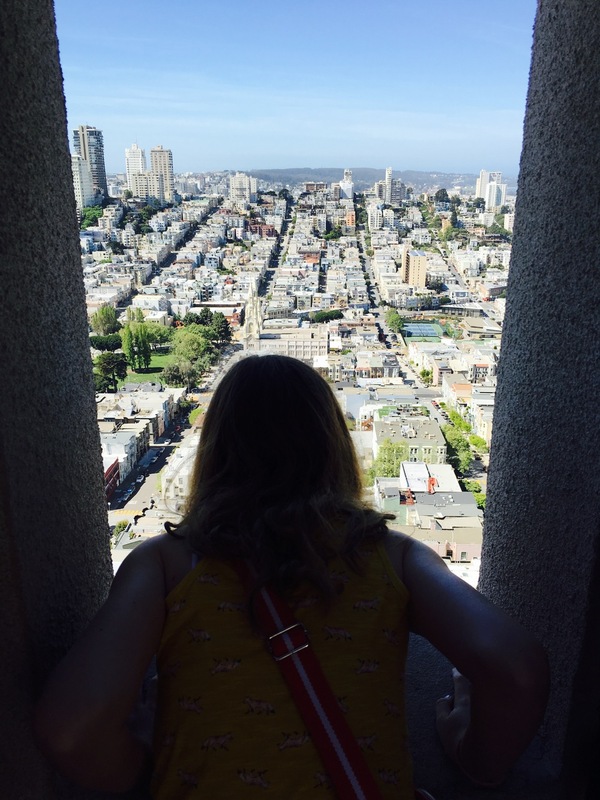 It was fun seeing through her eyes and hearing her screaming for joy as we went up and down, around and around. We ventured around the boardwalk and then found the best acai bowls I have ever tasted at a cafe called Samba Rock. They currently do not have a website, but if you go to Santa Cruz, this place is a must! The downtown of Santa Cruz is quaint with shops and food and an all around pleasant feel. After Santa Cruz we headed up north where we stayed in a town outside of San Francisco called Tiburon. We had such a lovely time and it was a great experience for our kids. Stay tuned as I will share more about that part of our trip and the big city of San Francisco tomorrow! Have a lovely day darlings! What brings you joy? God, family, friends, freedom all come to my mind quickly. I believe my joy is up to me and my daily choices. I wanted to think outside the box of joy and ponder what really makes me tick daily outside of my given God, family, friends and freedom. Thinking outside of the box. Colors. I am able to control most of what I see and take in. Colors are so beautiful. They mix and intertwine and make up such a beautiful landscape. I love to have that landscape in my home as it brings me complete joy. Infertility. I never in my wildest dreams thought infertility would bring me joy. We had considered adoption when we were madly in love dating and it brought us both joy to dream about. I look back and think, would we really have adopted without infertility? I don't think so. Infertility was a dark hole for four years. However, at the end of the dark tunnel came a joy that I had never experienced before. A joy that brought me my son, FAITH, a different culture and love. Flowers. It seems simple, but flowers literally bring a smile to my face wider than I can express. I get complete joy from these fresh things and my home looks lovely adorned with them. Africa. In particular Ethiopia. Everyday I think of this beautiful country and it brings me so much JOY! The people, the beauty, the landscape. We were blessed to be able to travel twice to Ethiopia and we hope and pray within the next few years we can bring our kiddos there and show them where part of our family is from. Joy. Health. It gives me complete joy. Speaking of health. Veggies and greens. We are so blessed to live in a country where we can go pick out any fresh veggies and come home wash them and prepare anything we like. Wow folks. That is joy. Sea salt cardamom hemp lattes. What? I can get them at one place in my little town. I sit there and sip them so slowly and smile away. Joy peeps. Hubby. In conclusion I must give a shout out to this guy. To watch him be a Godly leader in our family, an amazing father to our kiddos, a husband who works on our marriage....that my friends is Joy. Marriage isn't easy. It takes a lot of work, faith and communication. It is up to us to make it the best we can in this little life we have and bring joy to it. Joy my lovelies, what is yours? Please share.